Okey Dokey! These bad boys are finished. Check. it. off. the. list. Have you ever tried to decorate 96 square feet of space? Yeah, me neither, so it was definitely a task. Here it is. Ta Da! In case you can’t remember where we started, this is the blank slate that was staring at me. To be honest, I’m being overly dramatic. The placement of things was pretty simple for me. Finding enough things to fill it, however, got to be a work of art. I only purchased four items for this whole thing, and the print below was the first piece I bought. It was a no-brainer. When three separate women comment on it in the checkout line, you know you’ve got a keeper. The rest of the items I already had. I know, right? Someone collects too many accessories. Of course, they didn’t all start out looking like this. Fabric and spray paint were my best friends this week. I’ll show you later how it all came together. My requisites included two things—it had to have storage (#1 of course), and it couldn’t look too busy. “Too busy” of anything starts to make me break out in hives. A wall of bookcases could have been just the ticket to busy-ville, so I had to be careful. I’m having fun filling all the empty containers now. Of course, telling my husband something is “in the white box on the shelves” has proven a little more ambiguous than I anticipated. He’ll figure it out. Someday. Thanks so much, Tricia! I really appreciate it. Love the bookcases, and coincidentally just bought the dress form artwork the other day. I bought ‘her sister’ too. Awesome job! 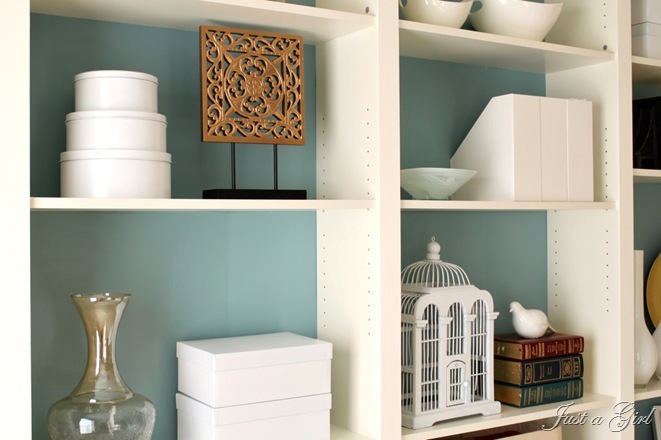 Your bookcase decor looks amazing. I love the contrast of the white and teal. You did an exceptional job. I love it…every bit of it. Holy smackers!!! This is absolutely gorgeous!! So elegant and chic. LOVE IT. Awesome comment, Erin! Thank you! Looks fantabulous and to think, it all started w/the Billy!! We have two Billies here, but I don’t think they’ll ever be transformed to that awesomeness. My husband and I don’t have those skills:). Thanks for the inspiration. I need to finish a playroom makeover and I was starting to lose steam. Always helps to see someone elses’ end result to light the fire back up! Have a great week!! Believe me, Kim. There was a time that I thought my husband and I didn’t have those skills either! Don’t sell yourself short! 🙂 Thank you! Looks fab. I really like the contrasting paint color on the backs too. Nice job. Thank you, Pine Tree Home! LOVE. I’m dying to do a wall of Billys myself, and yours turned out beautifully. This looks fantastic! Elegantly styled and so beautiful – I love it. Job well done! Awesome! Thank you, Jenny! By the way–I’ve been replying to your comments for months, and I just realized that I’ve had it turned off. Dar! Just thought you’d like to know that I don’t ignore your sweet comments! This is perfection! I love every little detail, you did a wonderful job! Thank you, Jessica! It’s appreciated! I like it, but I think it needs some books! That’s what I loved about your inspiration pic – bookcases with a mix of books and other accessories, it made it look more purposeful and substantial! You did an absolutely fantastic job! I love the turquoise background and you have done a fabulous, perfect job of accessorizing! Thank you so much, Nicole! That was really nice! Please do tell….where did you get the lovely talked about print from? They’re beautiful, but what a tragedy to have a wall full of bookshelves with almost no books on them!!! I would love to see these filled with a book collection. It look sreally good. I love all the different elements you used in there, very creative. And the colors are perfect too. Great job! Such a good job. I’m sure it took lots of patience. Sometimes I get impatient and begin to take short cuts….so lazy…but this looks AMAAAzing. Love the accessories. Wow, it turned out beautiful. 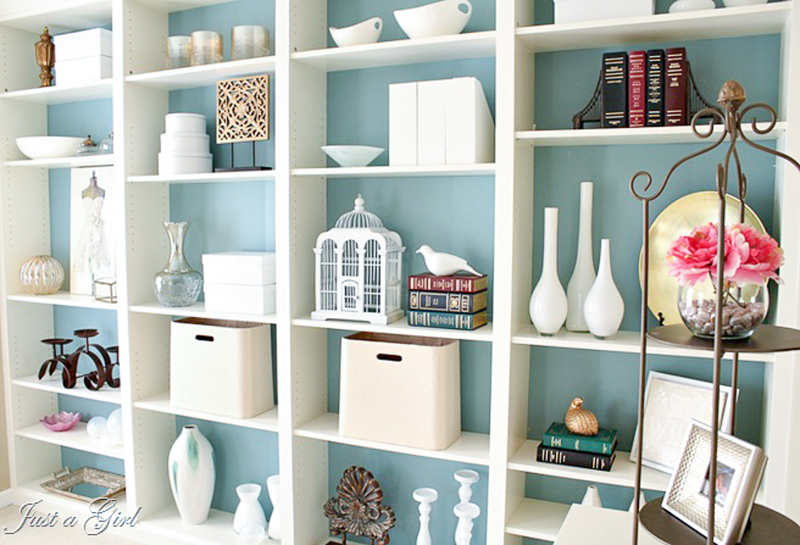 I love it, especially all the white against the painted backing of the shelves. Gorgeous! I LOVE it!!! I wish I had a wall with out a window I could devote to doing the same thing. Stunning!!! Ha! I will pass that onto my applicable helpers, Donna. Well said. 🙂 Thank you!! I absolutely LOVE them and see nothing but gorgeousness one each shelf! Nothing tragic anywhere ;). Fantastic job!! these are fab! seriously. girl, you got it goin’ on! Beautiful job! I love how the white pieces pop against that gorgeous blue. What color is that? It’s perfect! Thank you, Gina! I really appreciate you stopping by! It’s Boca Raton by Ben Moore. It’s so beautiful and inspiring! You have such a touch for decorating, thanks for sharing it with us! Absolutely gorgeous! I am in the process of building my own, and it will be used for books, but also hoping for a few oter things on the shelves too. The bird and cage are definites!! Chris-girl!! These are gorgeous, I just might have to steal this Billie idea when I get in a house. Love, love this, great job on the accessorizing. 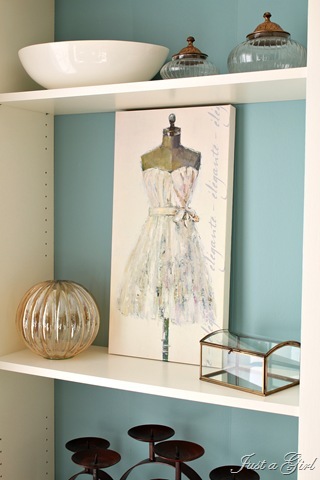 This is perfect for a craft room office space. Hey, did you get my email about the guest post? I need to get on it, going to the beach this next weekend! Thank you, friend! What’s so awesome about that is that you CAN do this ’cause you’re gettin’ a new house! Woo Hoo! 🙂 I hope you do it! I love to see everyone’s different versions of them. I have SUCH a hard time filling empty spaces, because I want them to look clean and simple, but not naked… ya know? You did FABULOUSLY! I love all the clean white dishes and such. So pretty! 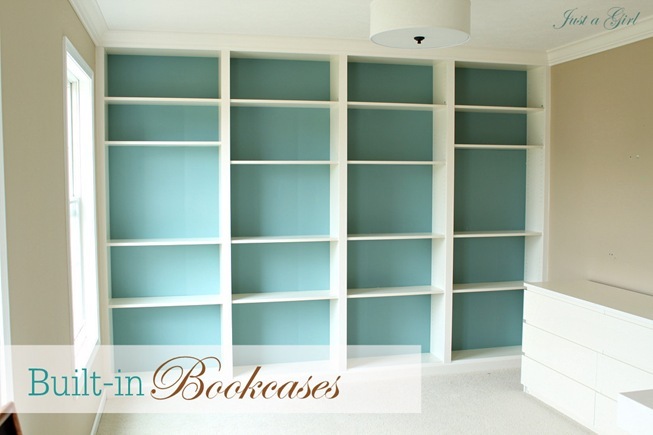 And the color behind the bookcases is perfect! Nice work, like always, friend! Gosh I’m glad we’re friends! It sure does wonders for my self-confidence. 🙂 Love you, sweet girl! Thank you! Thanks so much, Wendy! I appreciate you stopping in! LOVES! I would have broken out in hives decorating them! You did amazing. I am sstill learning that whole visual triangle thing. You nailed it Chris. You’re so sweet, friend! Thank you, Beckie!! Beautiful! I love how you kept to a color scheme of whites and golds, with just a few darker pieces thrown in for contrast. Love it, you are the second built in billy’s that I’ve read about and I must say I do love it. Thank you, Toya! I’m so glad you like them! Here’s the link answering some questions, Sia. It’s Benjamin Moore’s Boca Raton! If I could tell you I love you in ten different languages, I would! 🙂 Thank you, sweet girl! What a great thing to say! Amazing! I would never in a million years guess that this wall was created with Billy bookcases. Love the blue backs, love the accessories, love the styling… LOVE it all! Awesome job! Thank you so much, Jenna! While it was a big task, it sure was fun playing around with the decorations. 🙂 Thanks again. love the colors! looks professional! LOVE the turquoise/teal/blue against the white – my kind of colors! Just re-did an extra bedroom in the house with white beadboard and looking for a contrast color, this might fill the bill – thanks for the inspiration! It looks really great! I would love to do “built ins” in my living room. I too don’t really need book storage so I can appreciate your styling! Wow, they turned out great! Love, love, love the dress print. 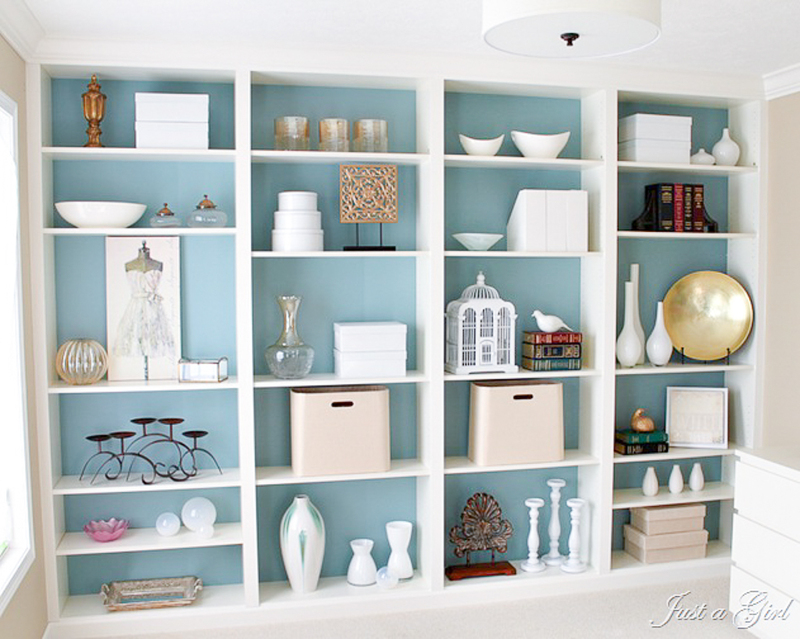 You did a beautiful job accessorizing the shelves. Wow! They look incredible.Like something you’d see in a decor magazine or Crate and Barrel.Spray is my new best friend. It’s amazing how paint can transform odd pieces into a coordinated collection. If I were on that line when you were buying that print, I would have been praying that you’d cahnge your mind and put it down! Great job! It looks so good! I love the teal color! Thank you, Amy! I appreciate the comment! I sure did, Anna. The tutorial can be found a couple of posts before this one! Thanks! It’s PERFECT! All it needs now is a kleenex box. 🙂 Love the color and well, pretty much everything about this project! Wow! I’ve been talking about hiring someone to make built ins to display my milk glass collection. This would be so much easier and less expensive. Thanks for the wonderful idea. I hope it turns out half as beautiful as yours! Looks Great! Love the white. The blue is awesome. We were going for this look in our play room but opted out on built-ins since we are renting. But, just thought you’d like to know only the bottom shelves actually have books on them! 🙂 Heading over to see how you made the shelves. Thank you for stopping by, Wendy J! It’s a favorite project of mine, and I love the storage it’s given me for my craft room. Thanks again! The only problem with that, Rachel is that I didn’t need it for books. I have storage for those already. The whole point was to have extra storage for my craft supplies. Mission accomplished in my opinion! Oh, hooray! I’m so glad, Sophie! Thank you! You couldn’t have left me a better comment, Kelly! Thank you so much! I hope you build them and love them as much as I do! Thank you thank you thank you!!! This saves me about 2500 dollars. You’re the best. It looks fabulous. WOW!! These are absolutely STUNNING and you decorated them beautifully. What style! I love the blue background. You did an amazing job on these. I just got back from Ikea tonight. We’re getting the Billy Bookcases too, but in the black brown cuz of my house colors. I wish I could have mine have the built in look too, but it won’t work for me … I just wanted to take a moment though and tell you this is fabulous!!! I’ve Pinned your post so I can check it out later when I DO have a place where I can do this!! Thanks for the inspiration! This is amazing. Its a great result after so much hard work! Ikea 2013 has finally arrived in Australia so thanks to this, I’m all inspired to do a Ikea Hack of my own. Agreed, Elizabeth. I’m so glad we were able to figure it out for sooo much less! Oh, I absolutely adore this! It made me daydream a bit about owning a house at some point. If only! I shivered a little though at the thought of dusting everything on these shelves! Ha! Me too, Erica! That’s why I haven’t done it yet. 🙂 Thank you! I have billy cases and wanted to paint the backs. How did you prep the backs? I’m fearful the paint won’t adhere b/c they are not wood. Love, love, LOVE this! I’ve been trying to figure out how to decorate our home office for months and am so happy to have found your blog for inspiration! 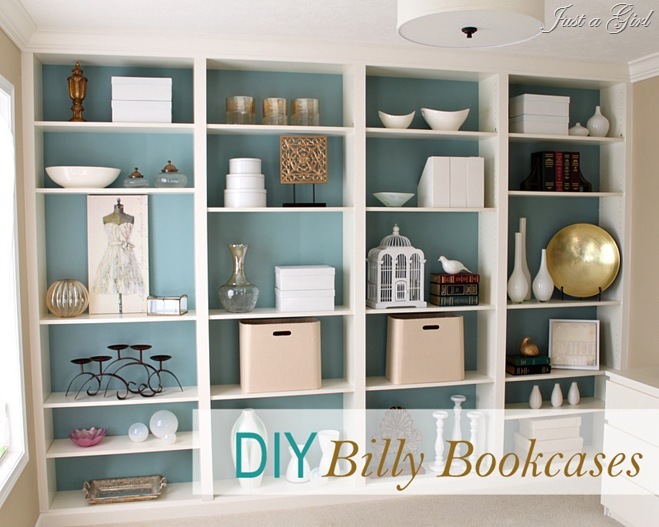 I just bought some Billy bookcases and Benjamin Moore Boca Raton paint today! What is the color of the other walls in the room? The whole look is just stunning. Thanks for sharing!